Didn't spot the clamps at first, great idea. How is the dinghy progressing? Well Christmas is almost here.... How is the boat coming along? Amazingly enough I was working on her today and yesterday. Yep, Chrissy probably is doable. Three planks scarfed and ready to put in and then a few shorter bits to be cut, scarfed and installed. I succumbed to using power tools ie angle grinder for scarfs and multi tool for trimming. Tried to get copper nail/roves with a larger diameter head to replace the ones l had to remove... no go. Found if l put them in the vice and hammer the heads they spread out well. The 70 yo old formwood is not as strong so figured a wider head would compress it less. Ideally l would like to replace every plank but that is not going to happen. How tough is epoxy two part paint? I recall HA used it. Might have to reinforce the transom to take an SD. Might need to put a straker (?) on either side from bow to stern to strengthen her up. Looking forward to making a steamer from a bit of conduit to bend some wood. Not sure what to use to pump steam in but will sort something out. 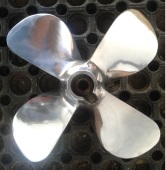 Also l would like to put strip of metal along the bottom of the keel. Fun! Good to see you are still plugging on. I could not work without my 18v drills, jigsaw and swapmeet B&D circular saw. Two pack paint is very tough but I wouldn't use it on your dinghy as it will flex (nail & roves) cracking paint at the seams. I should be telling you to use a Marine Enamel or similar but there are other cheaper options, if it was my dinghy it would be painted 100% no varnish or bare wood. Looking at your photos to strengthen it I would continue repairing all the ribs (replace or sister another), replace the Breasthook and any knees that have damage. Gunwales look ok if that is what you mean? Pity I don't live closer would be fun helping you get the old girl sorted. Thanks John, the planks are chamferred and glued to each other so in effect it is similar to stich and glue with the ribs acting as a formwork. One reasons I'm enamoured to this boat as it seems be a transition period when they first started using formwood (plywood) but still used steamed ribs and copper nails/roves. From research of early magazines it fits nicely into circa 1948 to '51. Good point re cracking with two part paint. Seeing as it is glued I'm wondering if it is rigid enough to prevent cracking? I was thinking of keeping the "distressed" look and clear varnishing over it but that is probably just a whim. I'll replace the knees. The breastplate will sand back ok unless l make a deeper one and put a locker underneath. That can be a later mod. Figurehead?? Have you heard of a "flex agent" that you add to the two pack paint? Could be the go. It is not a "straker" but a "stringer" that l need to install on either side (inside) to further strengthen her. Also a bulhead at three quarter bow though l think that is more if l put on a sailing rig. A square sail would look good. Flotation?? It will flex they all do unless it is a full epoxy build, forget the additives go to a paint manufacturer and ask I went to Protec and Seahorse Marine Paints also ask a Shipwright what they would do (will probably say its scrap). Looking at the photos the poor thing has lost its shape, years on a trailer full of water (guessing). First job should be getting its shape back that's means re ribbing (or sitting another along side) can not advise here as I have never had the pleasure, Google might help here. After you have the hull looking fair something I used may help preserve her was a wood preserver, I used this. I put two coats on my boats extra on the end grains. If you can get the hull back into shape and planks repaired don't think you need to add stringers, but I'm no expert. Do you remember Rob's Green Bean at the first nationals, I think it looks better now than it did back then and he uses paint from Bunnings. Currently I am rebuilding an old English coach built double adult sidecar, it has been outside since 1968 with just a sheet of iron over it really was only good as for a pattern and its fittings. Have been cutting out the dry rot, one section the side wall ply centre veneer has rotted away what I am going to do is dig out the rot, then replace the missing veneers with an epoxy fibre mix clamping it to straighten the bubbled plywood, hope to have it ready for the All British Day in February. Might build one of these after this. I like the mouldy look. Saw the following article on making a mast and thought of your project. Even if the idea of returning your boat to sail no longer has appeal, the comment in the final panel regarding 'boat soup' may be of interest. Yes the 'soup' mixture does appeal to me. Boiled linseed oil, turps and pine tar. Would smell the part too. Maybe coat the motor in fish oil. Thanks! A boat treated with 'boat soup'. Nice isn't it? Sometimes dryers are added to the mix immediately prior to application. This apparently makes the finished surface less tacky. Also, note the stringers which were not made by steaming. What is a dryer? Something that evaporates quickly l would imagine. Yes l thought of cutting ribs from ply etc. Stringers? Like the Norse way of shaping branches to correct shape while they were growing. A generational thing. Yes, rib not stringer...doh. I'm impressed you recognise it as a norse design.